We have a winner of the latest Name that Amish Community quiz, who got the right answers in yesterday evening just before the bell. Well done to Linda, who wins a year’s subscription to Family Life magazine. For those curious, I wanted to explain the thinking behind the quiz and how you could have solved it (with a bit of work! 🙂 ). Since I suggested in the comments it would be better to figure out photos #1 and #3 first, then #2, I’ll explain them in that order. The photos were taken in three different states. None of these communities is larger than 15 church districts in size (as of September 2013). You can drive from community #1 to #2 to #3 without having to go through any other states in-between. One of these communities was founded in the 1960s, and two were founded in the 1980s. The clue here was in the sign. I intentionally cropped the photo so that only part of the number was showing. It is indeed a telephone number. I left the last 3 digits, “663”, and then just a bit of the fourth–a curve which should have indicated that this could be only one of 2 numbers, a “0” or a “9”. The word was also truncated, but I assumed most of us would see that as “Shoppe”, as there are few other words (maybe none?) that have that ending. 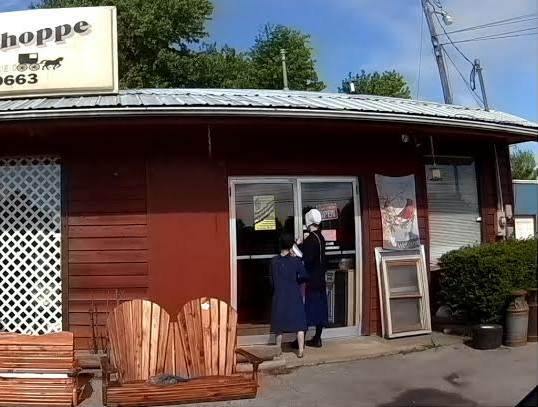 If you Google “Shoppe 0663”, you probably won’t get anything suggesting an Amish community–I get a body shop in Roanoke VA, and a countertop shop in Naples, FL, among the results on the first page. But if you Google “Shoppe 9663”, you should get “J & J Country Shoppe – Munfordville KY” among the results near the top. Google results can vary, but I also checked this in Bing, with similar results and Munfordville appearing right near the top. Looking at the linked list of Amish settlements I included to help, we see the Munfordville/Horse Cave KY settlement has 14 churches and was founded in 1989, so it fulfills clues 2 and 4. The kapp style in the photo may have been an additional clue, not enough to figure it out alone, but enough to rule out say a Lancaster-related community (where the kapp has more of a heart shape). So given all this, it’s a reasonable bet this photo is from the Munfordville community. And so now we know more or less what part of the country we are in, but where to head next? In addition to the 4 main clues given, I suggested in the comments section that you may want to work with #1 and #3 first, then go to #2. There were two signage clues in photo #3–a license plate and a number (17) attached to the horse-drawn equipment. You can’t read the words, but you might have recognized the Michigan plate design or found it by Google image searching the license plate designs of states in the region (thick blue stripe at top, which is common to a number of Michigan’s plate designs; Google search “Michigan license plate” and you should see one just like this one right near the top). 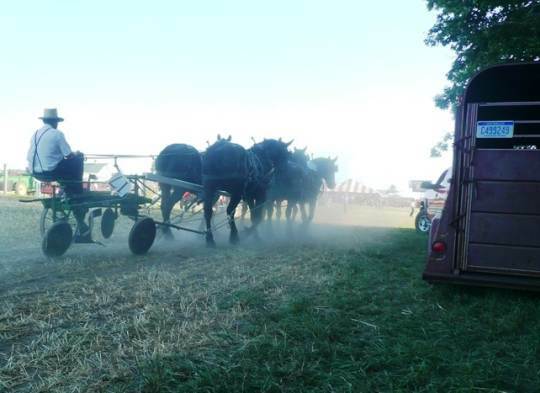 We can see in the photo an Amishman driving some piece of horse-drawn farm equipment towards what looks like a tent and some other equipment in the distance. This, the number hanging off the equipment, and the presence of the truck suggest some kind of event–possibly an auction? I would probably think auction myself first, but in this case it was something different. If you’ve read this blog for a while you might remember a post a couple years back (summer 2012) on Horse Progress Days in Clare, Michigan. If you recalled something like that but couldn’t remember quite what it was, you might have searched for something like “amish michigan horse event” in the search box in the sidebar of this site, which should have given you the Horse Progress Days post among the first results. In that post, you’ll see similar clues, including a red-and-white striped tent top and similar numbers on horses in the photos. Checking the settlements list we see Clare, Michigan has 4 church districts and was founded in 1981, fitting both clues #2 and #4. This photo was among those I didn’t use on the original Clare Horse Progress Days post, and was taken by Michigan Mary. So by the original clues I gave, what we have left is a community founded in the 1960s with no more than 15 church districts. Clue number 3 also says we can drive from #1 to #2 to #3 without passing through any other states. Since we know #1 is in Kentucky and #3 is in Michigan, that means #2 can only be in either Ohio or Indiana. This was probably the hardest to figure out, since you really had to figure out #1 and #3 to get here. Also, it has the fewest visual clues (no signs). There was also a confusing bit here that I hadn’t anticipated–the fact that none of these vehicles has an SMV triangle. 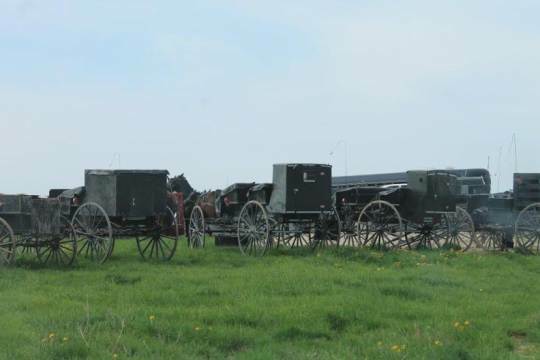 Since we know that Swartzentruber Amish don’t use the triangle, that and the plain appearance suggested these might be Swartzentruber vehicles. Looking at the settlements founded in the 1960s in Ohio and Indiana, one of them–Peoli, OH–is listed as a Swartzentruber community. However, there is one key clue here pointing in a different direction, and that is the style of buggy. All of them are open, and most of these feature the “kid box”, which is characteristic of Swiss Amish settlements. You might remember seeing this post last year explaining what this feature is, basically a container for children to ride in offering protection from the elements. If you figured that out, you had to know which communities of the handful founded in Ohio or Indiana in the 1960s are Swiss. If you didn’t know that Hamilton (Steuben County) was Swiss, maybe you had a really good memory and recalled that this community appeared, briefly, on this site before, in a post on Amish buggy styles, in reference to a photo of a Swiss Amish buggy (2nd one down from the jump-link), with kid box, in Steuben County, Indiana. Interestingly, that photo also lacks an SMV triangle, and based on other photos I’ve seen, it appears that this plain community also does not use the triangle. This photo was taken by contributor ShipshewanaIndiana at the Hamilton auction a couple of weeks ago (we’ll have more on that event soon). 1) Munfordville/Horse Cave, Kentucky (Grayson & Hart Counties). Founded 1989, 14 church districts. 2) Hamilton, Indiana (Steuben County; listed as Indiana community but also has households in Williams County, OH). Founded 1964, 1 church district. 3) Clare, Michigan (Clare & Isabella Counties). Founded 1981, 4 church districts. Thanks to all who took a crack at it, and congratulations again to Linda for nailing down the right answers. Well, I’m please to hear these results (though I didn’t take an official guess). I got Munfordville and Clare with no issues and guessed Swiss Amish on the 2nd pic. I started to look at small settlements in Indiana, but said, “NAH…you are way off base anyway”. 🙂 Me thinks I’ve read more books and seen more on here than I realize! Glad you are enjoying An Amish Paradox, excellent book. Yes, An Amish Paradox has been a great read. I’ve also been pleased with the articles in JAPAS as well. Thanks for posting when a new issue comes out! Thanks for the explanations; very interesting. I thought about guessing Munfordville for #1, but didn’t because the woman’s white covering looked different from the type of fabric I remember seeing women wear in the Munfordville settlement. Also, surely thought # 2 was a Swartz. settlement due to no SMV, but then went to your link mentioned here and learned more. It would be interesting to learn more about the number of non-Swartz. settlements that also don’t use the SMV sign. Always enjoy the quizzes — looking forward to the next one soon! Al I’ve just added a few small additional details to the explanation above in the brief time since it was posted; in one of them I suggested the kapp style should rule out Lancaster related settlements (that said, to me it was clear this wasn’t a Lancaster heart-shaped style, though maybe it is not so easy to see in the photo, and I also have the benefit of knowing where the photo was taken 🙂 ). Is there something distinct about the fabric used in that community? I have been there and seen the coverings, but my eye for that type of detail is not so sharp. As far as non-Swartzentruber groups who don’t use SMV triangle, it’s a good question. It seems I’ve come across them occasionally but can’t tell you which offhand. Will let know if I run across that info again. Thanks for the additional comments. When I go to Munfordville next time, I’m going to observe kapp style and then come back and look at this picture. I remember the kapp style being of an opaque fabric like the northern Indiana women wear rather than a solid fabric like Swartz. Amish women wear. It’s interesting that the shoppe in the picture is south of Munfordville near Rowletts. I’ve not been in that part of the settlement. The settlement is so spread out over many miles and I spend my time in the western part of the settlement, so haven’t seen that shoppe. I know the Paoli, Ind. settlement does not use SMV signs. They are not Swartz. and I believe are part of the Kenton, Ohio group. There are several settlements that are part of that affiliation and maybe others in the affiliation also don’t use SMV. And the Paoli, Indiana community you mention too. Confusingly, there is a Swartzentruber group right in the same area. Thank you, Erik! And thank you to everyone for the joining in the clues! I wondered if the building in #1 was round or not; it was an illusion from the dash cam! Linda I know how to contact you already, will be in touch about Family Life. This was fun. Janina you had 2 out of 3 correct, just appearing in different answers 🙂 Pretty close, but it’s true the last one was kind of hard. Thanks for the great effort. Congrats, Linda! You will enjoy Family Life. My whole family just loves it. We have lots of old issues, but no subscription. But I had fun. Thanks Erik, for putting together a great puzzle! You are so devious, Erik! I WANTED to take a try, but just didn’t have the time (still not retired). But then, I usually can’t figure out many of the “adult” puzzles in Connection magazine, either (some of the kids’ puzzles are equally daunting, for that matter!) Maybe next time…in another 5 years! Congratulations, Linda, on winning the subscription to Family Life. You are one smart lady, as far as knowing Amish communities goes! Congratulations, and thanks in advance for replying and for sharing. I would say it was a joint effort, Wondercat. I had help from others on Amish America and tried to follow Erik’s clues. My husband had attended the Horse Progress Days, and I had seen some of those photos at that time. The more I looked at the horse demonstration and the tent, the more it seemed right, and some of the other readers seemed to agree that picture number 3 was Clare, MI, founded in 1981. The paper number on the equipment and the horse was the clinching clue. I thought the license plate was PA, but a Google search showed it could be Michigan. People came from many states, so the license plate didn’t mean too much. Last summer there was also a Horse Progress Days in Arthur, IL, but the clues did not match up; there were too many districts (29), too long ago (1864). I pulled out the map to see which states join Michigan. My mind was drawn to Munfordville, KY, slightly because the coverings reminded me of Geauga County style, and Munfordville stems from Geauga County, but it was just a hunch. I had Naomi’s help to figure out #1, founded in 1989. The buggies in #2 seemed Swiss Amish (no top). I couldn’t find the buggy post when I hurriedly searched for buggies. Following Janina’s example of making analytical calculations, I went to Erik’s link and hunted for a Swiss group in Ohio or Indiana formed in the 1960s, . Emily had #1 and #3 correct, so her tries eliminated Peoli, Ohio, and Salem, Indiana. The few Milroy people I know about are not Swiss Amish, so it was still an educated guess for #2. I thought maybe if they are on the Ohio line is why I don’t see the Indiana license plates. This puzzle was educational! Thank you for everyone’s help! Thank you, Erik, for the subscription! And that’s the rest of the story for the Wondering Cat! Thanks Linda, this was really interesting to read. Your methods were very interesting; reminded me of methods I used when I used to solve a lot of logic puzzles. I was especially interested in your comments about the coverings in the Munfordville picture. That’s what threw me off in number 1. They reminded me of Swartz. coverings, not a progressive group like Munfordville.